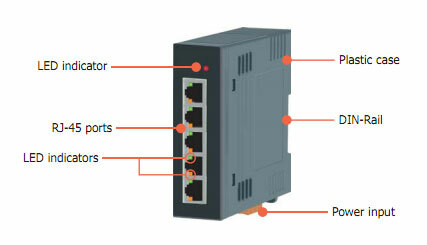 Unmanaged 5-Port Industrial 10/100/1000 Gigabit Base-T Ethernet Switch with Din Rail Mount. Supports operating temperatures from -30°C ~ +70°C (-22F ~ 158F). NS-205G is a 5-port unmanaged gigabit switch that supports 10/100/1000 Base-T, with a 10/100/1000 M auto-negotiation feature and auto MDI/MDIX function. It can connect 5 workstations and automatically switches the transmission speed (10 Mbps or 100 Mbps or 1000 Mbps) between Megabyte and gigabyte for corresponding connections. That is an ideal solution for bandwidth-hungry applications that may require gigabyte solutions (such as high resolution digital image transmission, video/audio file streaming/downloading, and server farm connectivity). Power Savings by Number of Connected Ports and Link Status: Computers do not require gigabyte Internet access all the time; neither do switches utilize all ports at all times. When a computer or network equipment is shutdown, switches often remain on and continue to consume considerable amount of power. With Power saving technology, NS-205G can automatically detect link status and reduce power usage of ports that are idle. Computers or any connecting parties set to standby mode (not power off), however, will not provide significant power savings.